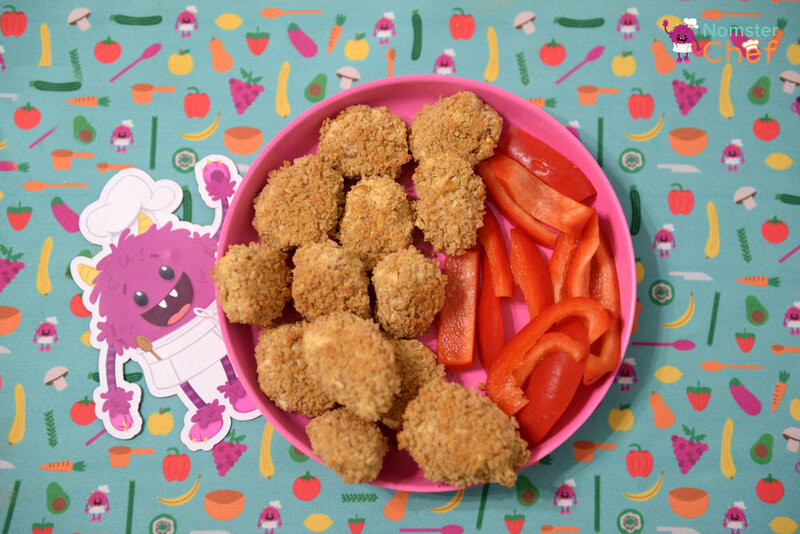 This week, Nomster Chef brings you a great alternative to chicken nuggets: chickpea nuggets! 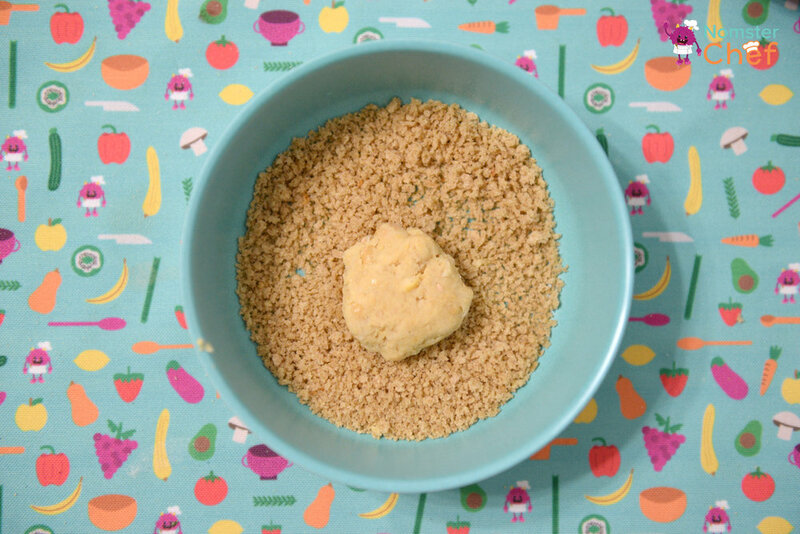 These chickpea nuggets are a fun, hands-on recipe for kids of all ages. It’s an easy recipe with few ingredients and they taste delicious with your favorite dipping sauces! This week’s kitchen vocabulary word is pulse. In this recipe, we pulse the chickpeas to make a chunky texture. Tip: the words “garbanzo beans” and “chickpeas” are used interchangeably- they’re the same thing! Use the can opener to open the 1 can of chickpeas and then drain the water in a colander. Rinse under the sink. Place the drained chickpeas into your blender and pulse the beans for a few seconds to a thick texture. Add 1 teaspoon onion powder. Add 1 Tablespoon of nutritional yeast. 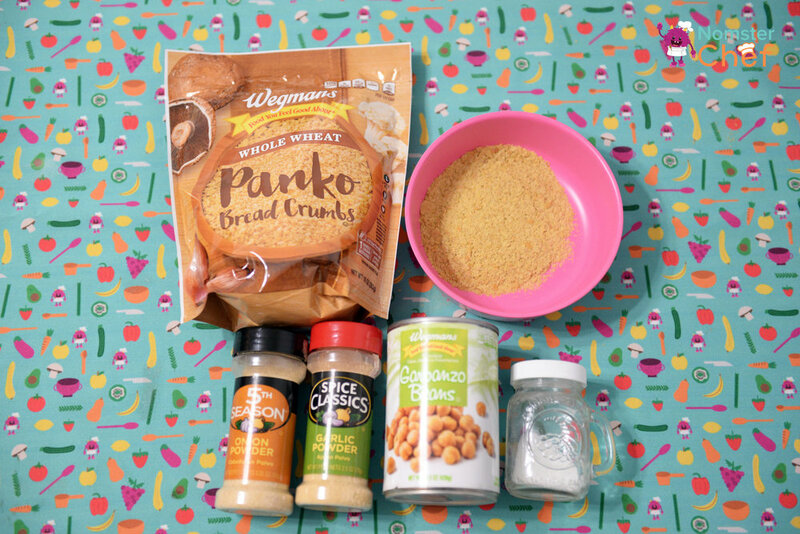 Add 1 Tablespoon of whole wheat bread crumbs or panko. Once you add the bread crumbs, pulse the mix until it has reached a chunky texture. To pulse means to chop into smaller pieces in a blender or food processor. Be careful not to blend the mixture too much. You do not want the consistency of hummus. It’s okay if there are still a few whole garbanzo beans in there! Measure ⅓ cup of whole wheat bread crumbs or panko for coating and place in a bowl. Using a teaspoon, scoop up teaspoon sized globs and roll them into nugget shapes. Roll nuggets into whole wheat bread crumbs or panko until nugget it covered. Lay each nugget on the parchment but don’t let them touch. Kid chef, set a timer for 20 minutes. ** Grown-up step ** place the nuggets inside the oven. Grown-up, once the timer goes off, flip the nuggets. Kid chef, set the timer for another 10 minutes. The nuggets are in the oven for a total of 30 minutes. ** Grown-up step ** take the nuggets out of the oven. Serve with vegetables once cooled!